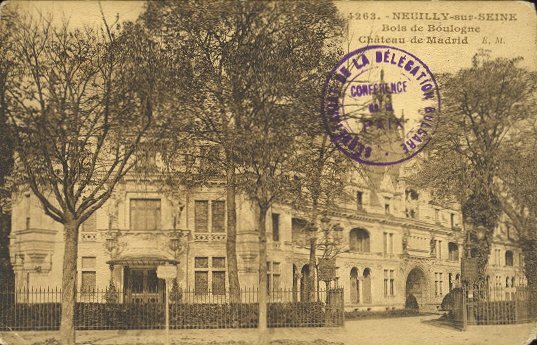 This is a French postcard of 1919 showing the Chateau de Madrid in Neuilly-sur-Seine. The Bulgarian delegation for the peace conference after World War I stayed here during the fateful days in November 1919. The Paris Peace Conference of 1919 was a conference organized by the victors of World War I for negotiating the peace treaties between the Allied and Associated powers and the defeated Central Powers. 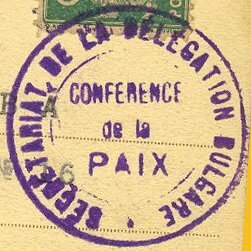 The conference, which consisted of several separate treaties, opened on 18 January 1919 and lasted until 21 January 1920, with a few interim breaks. Ottoman Empire (Treaty of Sèvres, 10 August 1920; subsequently revised by the Treaty of Lausanne, 24 July, 1923). 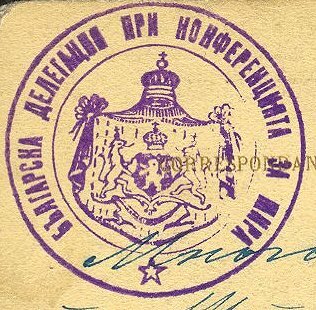 The Bulgarian delegates signed the Treaty of Neuilly 27 November 1919. The treaty deprived the kingdom of an Aegean coastline and provided the Bulgarians only an economic outlet to the Mediterranean. The Bulgarian government had to recognize the independence of the Kingdom of the Serbs, Croats, and Slovenes and agreed to pay $445 million in war reparations. The Bulgarian army was reduced to 20,000 men and the Bulgarian armed forces had to surrender most of their war materials. "Best greetings from Chateau de Madrid, the palais where the Bulgarian delegates for the peace conference lived in 1919. Svetoslav Pomenov, who was a young man at the time, was the secretary and interpreter of the Bulgarian delegation for the peace conference. Later he became Bulgarian ambassador in Bern, Bucharest, Berlin and Rome. In 1941 he became Chief of the civil cabinet of Boris III, a position he held until Boris died in 1943. The postcard is addressed to Ms. Velcheva, Ibar Street Nr.16, Sofia, maybe his future wife? There are no signs of regular postal handling on the card. 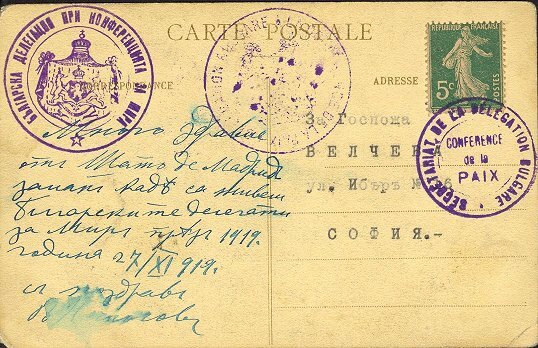 Thus, we believe that the card has been transported to Sofia together with the diplomatic mail from the delegation and delivered directly to the recipient. If you have further information or theories about this card, please send me an email!